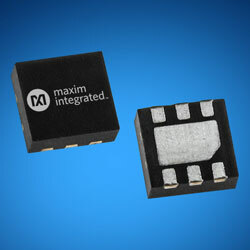 Mouser now offers the DS2477 DeepCover secure coprocessor from Maxim Integrated. The device offers extra levels of authentication and device integrity protection for industrial systems, medical sensors, and IoT tools. The device is a secure I2C coprocessor with built-in 1-Wire master that blends FIPS202-compliant secure hash algorithm (SHA-3) challenge and response authentication with the company’s patented ChipDNA feature to offer a cost-effective solution with excellent protection against security attacks. The device uses the ChipDNA output as key content to cryptographically secure all device-stored data. Efforts to probe or observe ChipDNA operation modifies the underlying circuit characteristics, which stops discovery of the unique value used by the chip cryptographic functions. The ChipDNA circuit, a physically unclonable technology, employs a random variation of semiconductor device characteristics that naturally occur through wafer fabrication. The circuit produces a unique output value that is repeatable over time, temperature, and operating voltage, providing a core set of cryptographic tools derived from integrated blocks.